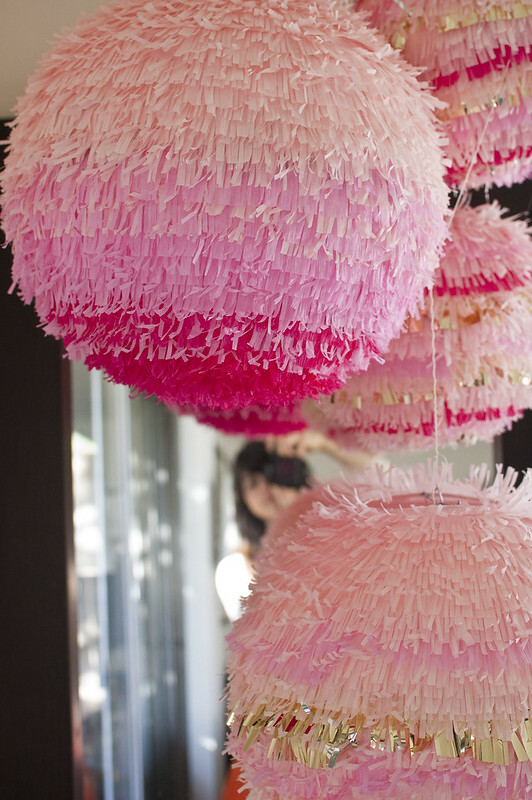 I first saw these fringed confetti lanterns over at Oh Happy Day and immediately marked them. The originals are actually meant to be filled with confetti, which I intended to do but then I wimped out (I'm really not a fan of vacuuming). The original tutorial is great and uses double sided tape. I'm guessing that it is MUCH faster than my method. My lanterns were large (10" and 14") and they took at least two hours each. I just think of that as four episodes of 30 Rock and it goes by quickly. I modified it because I needed a bit more coverage (the only lanterns I could easily get had dorky writing on them and I needed to cover it thoroughly) and I wanted to add additional colors and I'm obsessive and wanted everything even. I ran out of time to order the crepe paper folds, so I just purchased regular crepe paper streamers at the store, which means that all the fringe had to be individually cut, which is slower than the original method but gives you a really great, delicate texture. My fringe scissors were a lifesaver here. My method uses hot glue, so take my standard advice and wear gloves if you are prone to burning yourself. I didn't get any burns this time around, but I was careful. The easiest way to do the tutorial was to put all the photos in a set. Click here to step through them and read my notes and feel free to ask any questions in the comments on this post (sorry - I don't get comment notifications through Flickr, so I'm likely to miss any questions posted there). The photos are dark because the weather wouldn't cooperate, but I think you can get most of the details. Let me know if I've left anything out! Is there any way to buy the crepe paper already "fringed"? Did you also cut all that gold fringe for the backdrop? I haven't seen it fringed like this anywhere. There are a couple Etsy sellers that do fringed streamers, but they tend to fringe on both sides, which wouldn't work for this project. I didn't cut the gold fringe for the backdrop! I purchased a couple packs of it at Party City. You have to hunt around for it, but they normally have an aisle that is mostly metallic party decorations and they carry the fringe there. I used floor length fringe behind the drinks table and 15" long fringe behind the dessert table. Easy-peasy. fringe scissors seem like they'd be a game-changer in this instance. i love these so much, rache. SO. MUCH. Rachel, these are so lovely. I wanted to know if there was a way to make them so they could fold up again for easy transport? I'd love to make them for a friend's upcoming shower but would need to be able to transport them from home to the shower location. Thanks! They do fold up fairly well! I just took ours down (I know, it's been weeks - I've been busy!) and they won't fold as flat as the lanterns did originally, but they will fold a bit. I wouldn't smash them down too hard because it will probably make the fringe all wonky. I just collapsed them lightly and then put them in a box. They would be easy to transport this way. OMG! these are so cute. I love how they are ombre style, very trendy. after transforming them, did you notice them to be heavy? I have a feeling they might add some weight due to the paper tissues. Just curious! Well, they are heavier than the plain paper lanterns, but still really light! I hung them with some fishing twine and a staple in the ceiling and had no problems.